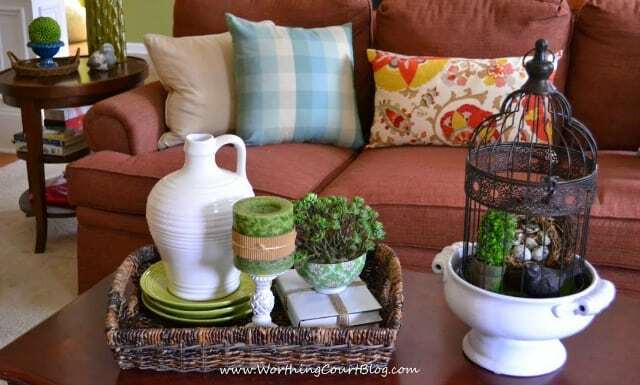 UPDATE: Enjoy this spring vignette in the family room of our former home. We’ve moved and are giving our new-to-us home a complete remodel. Click HERE to see my new farmhouse style! Hi everyone and Happy First Day of Spring! Welcome to day 4 of the All Things Home Swing Into Spring Party. Today, it’s all about spring vignettes. Make sure you stop by their blogs today to see what they’ve put together. We want to include you in the party too! 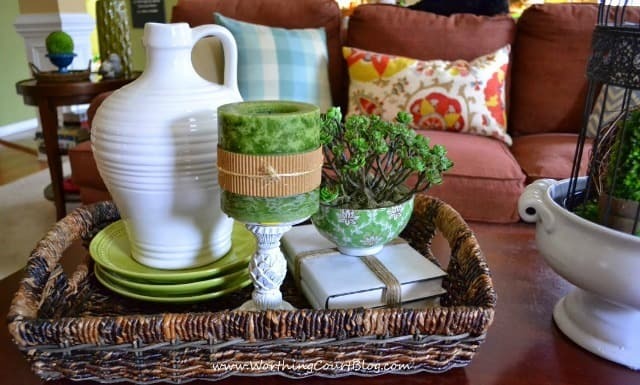 So you’re invited to link up your spring vignettes down at the bottom. The theme around my house this spring, seems to be fresh and simple. Spring is all about renewal – not complicated and fussy. I started with the same wicker tray and paper and twine wrapped stack of books that was used in my winter vignette earlier this year. Texture is key when it comes to keeping a simple arrangement from being blah and uninteresting. And there’s certainly a lot here – the wicker tray, the stacked books wrapped in twine, and a little chinoiserie bowl filled with faux baby succulents. Even the (formerly gold) candlestick has a raised pattern to it and the candle is wrapped in a bit of cardboard tied with more twine. Did you notice the photo bomb from my sweet shadow – Princess Zoey? I added an urn topped with a wire cloche to the vignette. This urn used to be gold, but the power of spray paint totally transformed it. The cloche is simply filled with a mini-topiary, a nest and little bird all nestled on a bed of moss. 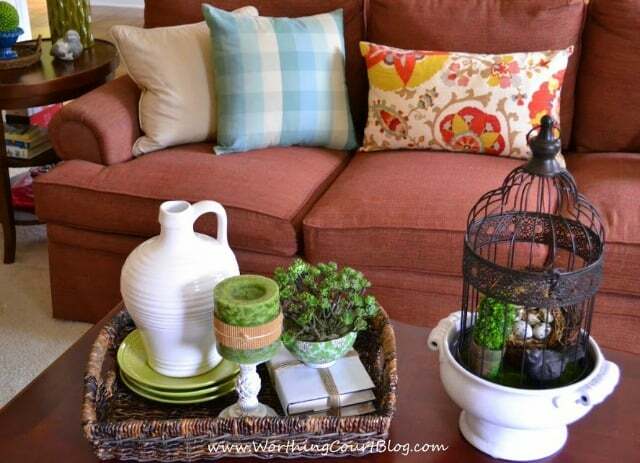 I completed the spring look in my family room by adding some colorful pillows to the couch. And now it’s my happy place. 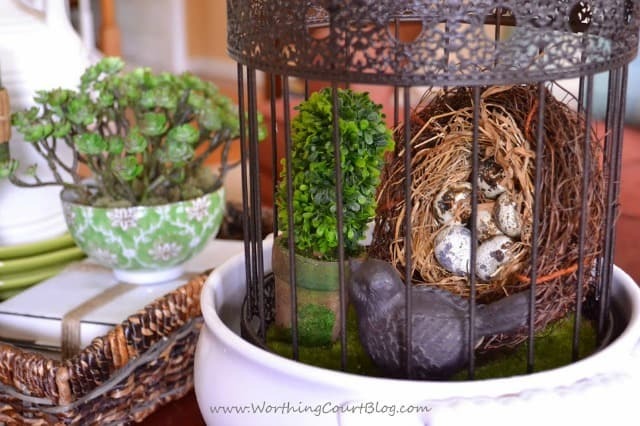 Suzy, I love your coffee table vignette and sweet cloche with bird & nest! Your shadow looks like she has found her favorite nesting spot too 🙂 Thanks for including me in the fun this week. Your vignette is gorgeous, Suzy! I love the cloche and the fresh spring green! My dog sits on the top of the couch like that – she’s a Dachshund – I tell her she’s acting like a cat! She just likes the vantage point so she can see out both front and back door. And bark – a lot. So delighted to join your party – I hope you have a blessed first day of spring! 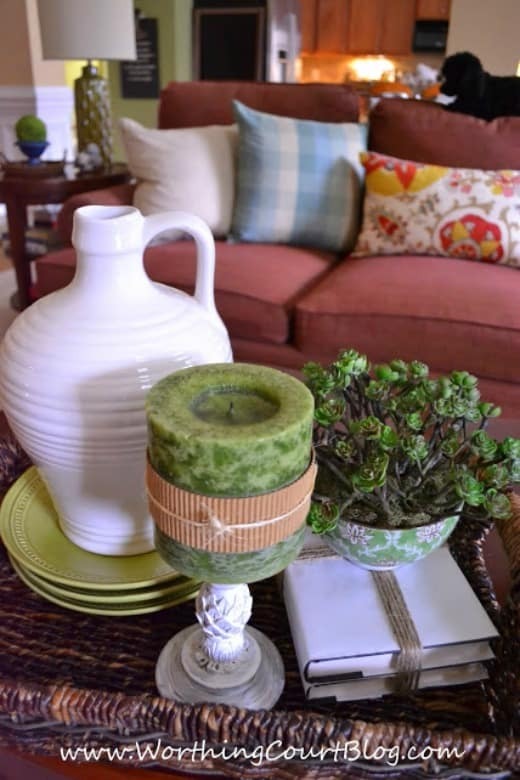 Love the pretty shades of green in your vignette! Happy Spring! i love your vignette, your living room is so warm! What a lovely vignette, Suzy! I do love all the visual interest with tone and texture. And I love your little photo bomber. How fun to have a buddy keeping an eye on you. Lovely vignette Suzy, you managed to incorporate so many elements in such a small space, but it seems effortless and uncluttered and simply Spring! Looks great Suzy! Love the sweet little nest, so pretty. How funny…your Zoe does the exact same thing that our Gucci does. He’s always on the back of the love seat and follows me from room to room when I’m taking photos. Love your spring tablescape! Thanks for hosting this weekly party….have a wonderful weekend! Suzy, this is such a pretty spring vignette. It’s perfect for your whole room. I agree with you about texture… such a wonderful tip. Thank you so much for including me in this wonderful Spring Fling linky! You are a wonderful friend and so sweet for including me. Thanks bunches and bunches.! This is so lovely, Suzy. You have such a gift for putting things together so they look like they were designed for it! You should come shopping in my attic and help me! Or at least inspire me to put up the Valentine’s decor! Such a pretty spring vignette. You are the master at these, my friend. I love all the texture. And I can certainly tell the different between a vignette and a stack of stuff! Love how Zoey is sitting on the back of the sofa. McCoy used to do that, as well. I used to call her my little parrot dog because she always liked to perch on the highest spot she could find, be it the couch or my shoulder. Now, the old girl can’t climb so high. What an outstanding vignette. Love the cloche it is so pretty. Love all the texture. 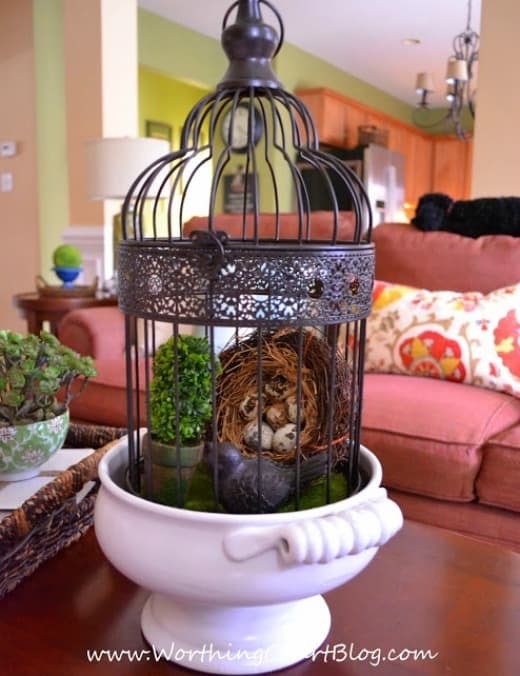 Beautiful vignette…love how you placed the metal cloche in the bowl…! !….and love that cute photo bomber!! Love it Suzy! 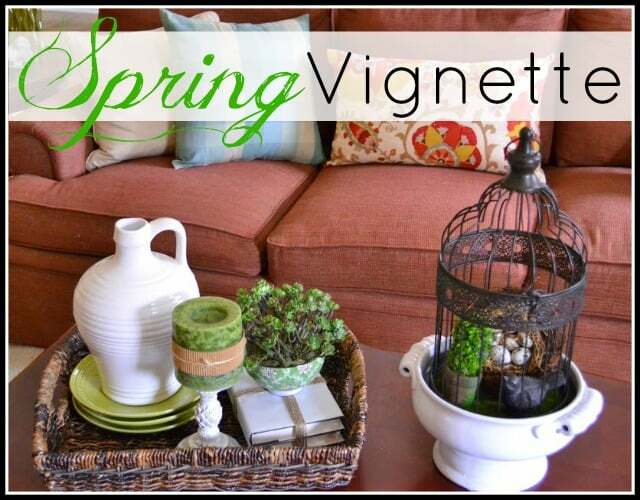 Your vignette really says Spring!! Great to tour with you! came across it and I’ll be bookmarkin it and checking back frequently! not involved except it’s one thing to ddo with Girl gaga! Youur personal stuffs outstanding. All the time maintain it up! I totally agree about texture!! It can completely transform a space. Love the spring touches!